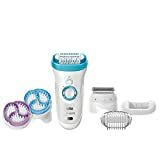 Epilator reviews – Best Epilators in India - Top 10 In India - Only The Best of everything! LATEST product list, updates regularly! You are reading the ultimate Epilator Guide for every Indian woman. Having used epilators for so many years, I am always excited to learn about the newest epilators and how to use them most effectively. As a woman, I am sure you have heard of epilators and know what they do. However, if you haven’t don’t worry, I will be explaining everything to you. It is important to know exactly what an epilator does, how it works and of course what features to look for and what to avoid. Let’s start with what an epilator is. Epilator basics – what an epilator does and why you should use one. The epilator is a device for removing hair. It doesn’t cut hair but actually removes it from the roots. Epilators have tiny tweezers which rotate as you move the epilator over your skin, and then they catch the hair and pluck it out. The great thing about using an epilator is that you don’t have to use it again for two weeks to a month. When you use the epilator, you will get silky soft skin for as long as a month at a time. Actually I can tell you with considerable confidence that if you start using an epilator, you will stop using razors and will no longer need to go to a salon and spend a load of money on waxing. 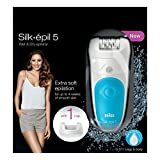 I have been using epilators for a long time and one more thing that I have noticed is that after using it for a long time, your hair starts becoming thinner, fewer hair grow back and also it takes longer for it grow back. That is really amazing as after some time goes by, you may need to use the epilator after longer periods of time. Also your hair will become thinner and easier to remove. After I started using epilators, I have completely stopped going to the salon and spending a lot of money to do waxing. 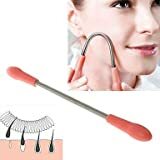 All the women I know, who use epilators agree that it is a wonderful and cheap hair removal method, and it also leaves you feeling and looking absolutely fabulous. Since I started to use the epilator I feel a lot better about my body and in fact about myself as a whole. With extended use it gets even better, and where I used to spend at least two hours epilating my legs and getting silky smooth skin, now it takes me only about 40 to 50 minutes. Here are a few tips about using the epilator most effectively. 1. It is best to use the epilator when your hair is still short. Don’t let your hair grow back too much. With the hair still short, it is easier and there is significantly less pain. 2. Don’t use the epilator when your hair is very short, as the tweezers won’t be able to pluck out really small hair. 3. Move the epilator slowly over your skin, while holding it straight, at a 90 degree angle. 4. Decided on your own when to use the epilator, just make sure the hair hasn’t grown back too much, and that it isn’t really short. 5. While using the epilator if you feel almost nothing, then you may be moving it too fast. When the epilator effectively plucks out the hair, you will feel a little pain. 6. I would strongly advise you to exfoliate after using the epilator as it prevents ingrown hair. 7. If you are sensitive to pain, then go in for a dry/wet epilator which you can use in the shower. While taking a shower the skin pores open up making it less painful to pluck out the hair with an epilator. There are many epilator brands and models around, and you must know what to look for and what value you should get from your epilator. Here I will give you some pointers to pick up the right epilator for yourself. 1. Make sure the epilator plucks hair out from the root and that it doesn’t just cut the hair very short. This is very important as that is the real advantage of an epilator. That is what makes the epilator such a great way to remove hair. 2. Epilators come with differing numbers of tweezers on the head. The more the number of tweezers the better the epilator will perform. 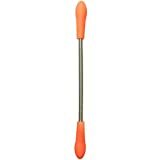 Look for epilators with the maximum number of tweezers for a truly great epilation experience. When removing hair from your legs, having more tweezers is especially helpful. 3. Make sure that your epilator comes with these accessories – Efficiency Caps, Cooling Gloves, Massaging Heads and Built-in Light. The Efficiency Cap ensures that you use the epilator correctly and in the right angle, thereby ensuring that you get best results, and also reduces pain. The cooling gloves also reduce pain, but you must use it only after you have done your hair removal, and not before it or during the process. The Massaging Head also helps in reducing the pain. The Built-in Light is to ensure that you see everything better and do not miss any hair. 4. You also need to check how easy it is to clean the epilators. Usually they are very easy to clean. 5. Another important point is whether to go in for a dry epilator or a wet and dry epilator. With the wet and dry epilator, you can use it in the shower. Under the shower the skin pores open up and it is less painful to pluck out the hair. 6. You should also see if the epilator offers one speed or has two speed options. Most epilators come with two speed option. 7. Another factor to consider, is whether to go in for a corded epilator or a cordless one. This is as per your personal preference, I prefer the corded one as it provides enough length to maneuver and is easy to charge. 8. If you are choosing epilators from a series like Silk Epil 3, Silk Epil 5 etc. remember that the main epilator might be the same in the series with the difference being in the accessories. So choose your accessories carefully. 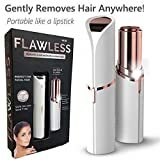 Painless Hypoallergenic Hair Removal Kit - A portable electric shaver for women, including facial hair removal head and body trimmer head. Easy adjustment to personal preference! Dry and wet for safe use - IPX7 upgrade 100% waterproof and works with gel or foam; The detachable razor head design and long cleaning brush make this hair trimmer easy to clean and safe to use. Enjoy your bath. USB fast charging and wireless operation - Lithium battery Epliator provides 50 minutes of wireless shaving time and supports fast USB charging, charging via a connection or direct power connection. 12 month warranty: You can write to us at some point if you have any problem, our customer service is here to help. PRODUCT QUALITY : Highly Powered Epilator removes hairs Instantly and Painlessly from Lip,Chin and Cheeks. Removes Peach Fuzz which help Make-up Glides Flawlessly. No more Irritation. No more Redness. No more Cut. FEATURES : It comes with 18k Gold-Plated in Beautiful ROSE GOLD, Discreet and Portable. High Finishing touch with LED Light. USE : It gentle enough to use Everyday - No Downtime waiting for Hair Regrowth. Easy to Carry anywhere. INCLUSIVE : This comes with the Epilator , Brush and Battery. Sealed pack 1 AA Unused High Power Battery. AS SEEN ON TV : This is the ORIGINAL Flawless Hair Remover same as seen on TV. Do not be fooled by Counterfeits. These epilator reviews look at two really good choices in the lower price range. You should get a good idea of what kind of an epilator you can go in for. The Phillips Satinelle HP6421/00 is a good quality epilator that keeps your skin silky smooth for as much as 4 weeks at a go. Inside the box comes several things, namely – Phillips Satinelle epilator, cord, sensitive area cap, cleaning brush, instructions booklet and warranty card. 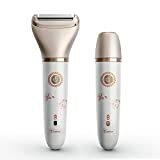 The main highlights of this Phillips Satinelle epilator are a sensitive area cap, washable epilation head, dual speed option, gentle tweezing discs, easy grip and hair removal till 0.5 mm length. The Phillips Satinelle HP6421/00 removes hair from the roots and works very well. The special cap for sensitive areas is useful when epilating underarms and the bikini area. An epilator removes the tiniest hair and is even more effective than waxing. The only downside is that you have to endure some pain, and when you do it the first time your skin will get irritated and red for a while. The good thing is that the pain reduces over time and also the hair growth and thickness also reduces. The Phillips Satinelle epilator performs very well, it has a long cord, removes hair very efficiently and is quite durable. Its design I such that you can use it easily on rams and legs and also sensitive areas like underarms and the bikini area. The sensitive area cap is very useful at it makes the epilation process less painful by covering the outer epilation discs. Since it has a cord, you will need a plug point nearby to use it. Also on longer use the epilator gets heated up. As with all epilators you should be aware that epilation causes in grown hair, which can be avoided by doing exfoliation after the epilation. Overall for it price it is a great product that will last a long time and give you a very satisfactory result after every use. Have a look at some great epilators here. The Braun Silk Epil 3 is a very good epilator for its price. You can club it with the cheaper epilators but its performance is great. 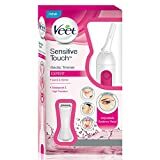 It has an epilator head with twenty tweezers, an efficiency cap, massage rollers, in-built light and it uses the SoftLift technology. With the Braun Silk Epil 3 you need to use the epilator twice over your skin to remove all the hair. This is not much of a problem, and its in-built smartlight helps in catching even the tiny hair that you may miss otherwise. The SoftLift technology helps in lifting up hair that is lying flat. This is quite helpful though you get flat hair only some of the time. It comes with a massage roller that gives a nice sensation intended to reduce the pain. This is a dry only epilator and your skin needs to be absolutely dry before you use it. 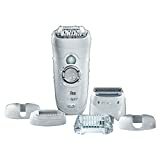 The Braun Silk Epil 3 has dual speed, with speed 1 offering extra-gentle epilation and speed 2 delivering high-efficiency epilation. It is a corded epilator so you will need a plug point to use it, but it has a long cord so using it is not a problem in any way. There are the massaging rolls that are supposed to ease the pain a little. I know for certain that the pain is still going to be present with the massage rolls or without the massage rolls. But, to give them their credit, they do offer a nice sensation. So, in my opinion, they’re not useless. The cons of the Braun Slik Epil 3 are that it does not remove hair from the roots with the first use. You need to go over your skin twice to remove hair from the roots. Also sometimes instead of removing really thin hair from the roots, it breaks them, but this is a problem with more expensive epilators too. All in all another great epilator for its price, with the add-on benefit of Soft Lift and in-built light. Take a look at the best epilators in India here.